This is the last Mountains to the Med tour so book now!! Remembering how my Icelandic mother was so overwhelmed by the beauty of the then Yugoslavia, now Croatia, I have always had it in mind to organise a tour there. An array of natural wonders with forested hillsides and beautiful beaches in Croatia and then sparkling crystal clear lakes and towering mountains in Slovenia.. We journey into the mountain regions and the coastal areas. The month of May has a very comfortable temperature. The tour will offer an excursion with insights of the Istrian region, which includes lunch in a family restaurant. Another excursion to a Slovenian family farm and a train journey through the Postojna Caves. Other visits worth mentioning include boat trip on Lake Bled, wine making visit and much more. 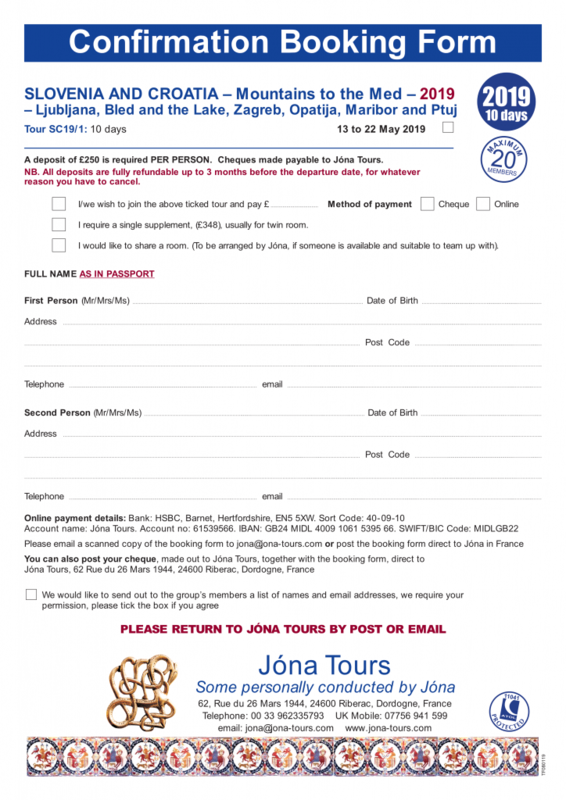 Please request the brochure for an itinerary . Flights from Heathrow Terminal 5 with British Airways to Zagreb. Return Flight from Venice to Heathrow with British Airways. 9 nights en-suite rooms with breakfast and evening meals. 4 lunches in family restaurants and a family farm. Members choose and purchase their own picnic lunches for the 4 other days from local bakers that have a good selection of food. Private guide for the whole tour. All gratuities to our driver and guide for the eleven days. All excursions some with local guides, visits and entrance fees. Ptuj walk around unique town with visit to wine cellars. Boat trip on Lake Bled, visit St Mary’s island and Bled castle. Ljubljana and the Postonjna caves on a train. Opatija then a days excursion to Istria, lunch at a family restaurant. Plitvice Lakes National Park UNESCO site with 16 lakes. Zagred explore. Lunch at a family farm. These 4 extra excursions are also included in the tour price. NP BRIJUNI – Visit NP Brijuni islands, one of the 8 Nationals Parks in Croatia, situated in Istria at the north-western outskirts of Pula’s port. The National Park consists of two larger islands, Veli and Mali Brijun and 12 islets. Only 3 km wide the Fazana channel divides them from the Istrian coast. VARAZDIN – Visit Varazdin – the city of baroque, young people, music, flowers and bicycles. “Little Vienna” with rich natural legacy interwoven in parks. A must see destination located in the north of Croatia on the southern bank of the River Drava. PULA – A wealth of Roman architecture in Pula. The star of the show is the remarkably well preserved Roman amphitheatre right in the heart of the city which dominates the streetscape and doubles as a venue for summer concerts and festivals. LJUBLJANA – Numerous visitors describe Ljubljana as a hidden gem of Europe. Its picturesque image has been marked by different historical periods and mostly by the opus of the famous architect Joze Plecnik.